Greenwich Mean Time began when two very accurate clocks were set in motion at the Royal Observatory at Greenwich, England. Greenwich Mean Time, now known as Universal Time, became the standard for the world in 1884. C. H. F. Peters discovered asteroid #203 Pompeja. A. Charlois discovered asteroid #338 Budrosa; M. Wolf discovered asteroids #339 Dorothea, #340 Eduarda and #341 California. F. Kaiser discovered asteroid #763 Cupido. M. Wolf discovered asteroid #840 Zenobia. V. Albitzkij discovered asteroid #1283 Komsomolia. E. Hertzsprung discovered asteroid #1627 Ivar; M. Wolf discovered asteroid #1134 Kepler. Y. Vaisala discovered asteroids #2243 Lonnrot and #2299 Hanko. The first commercial transatlantic telephone service began. The Palomar-Leiden Survey discovered asteroids #2799 Justus and #2934 Aristophanes. NASA launched Pioneer (P 30) from Cape Canaveral, Florida, in an attempt to launch a Pioneer satellite into Lunar orbit. The mission failed when the second stage of the Atlas-Able rocket malfunctioned and exploded. The US Navy launched Transit 17 from Vandenburg, California. Transit, one of the first operational satellite systems, was also know as the Navy Navigation Satellite (NNS). L. Zhuravleva discovered asteroid #3157. NASA's Skylab 3 mission (73-050A) returned to Earth after its crew had spent time aboard the Skylab space station which doubled the previous on-orbit record. USSR launched Cosmos 771, a military surveillance satellite advertised as being used for investigation of the natural resources of the Earth in the interests of various branches of the national economy of the USSR and international cooperation. Felix Aguilar Observatory discovered asteroid #2745; N. Chernykh discovered asteroid #2776 Baikal. A. Mrkos discovered asteroids #2325 Chernykh and #2403 Sumava. USSR launched Bion 5 (Cosmos 1129) from Plesetsk, a biosatellite to continue investigation of the effects of space flight on living organisms, carrying biological and radiation physics experiment packages from 8 countries including the US and USSR. Bion 5 (Cosmos 1129) was launched 25 September 1979 with biological experiments related to embryo development and radiation medicine. The biosatellite was designed for the continued investigation of the effects of space flight on living organisms. It carried biological and radiation physics experiment packages from Czechoslovakia, France, Hungary, Poland, Romania, German Democratic Republic, US and USSR. The capsule was recovered on 14 October 1979. L. G. Taff discovered asteroid #3403 Tammy. Soviet military officer Stanislav Petrov averted a worldwide nuclear war (Sept. 26 USSR time) by ignoring erroneous satellite reports that the US had launched a nuclear attack against the Soviet Union. J. Platt discovered asteroids #3237 Victorplatt and #3259. NASA launched the ill-fated Mars Observer (MGCO, Mars Geoscience/Climatology Orbiter) from Cape Canaveral, Florida, on a Titan 3 booster. 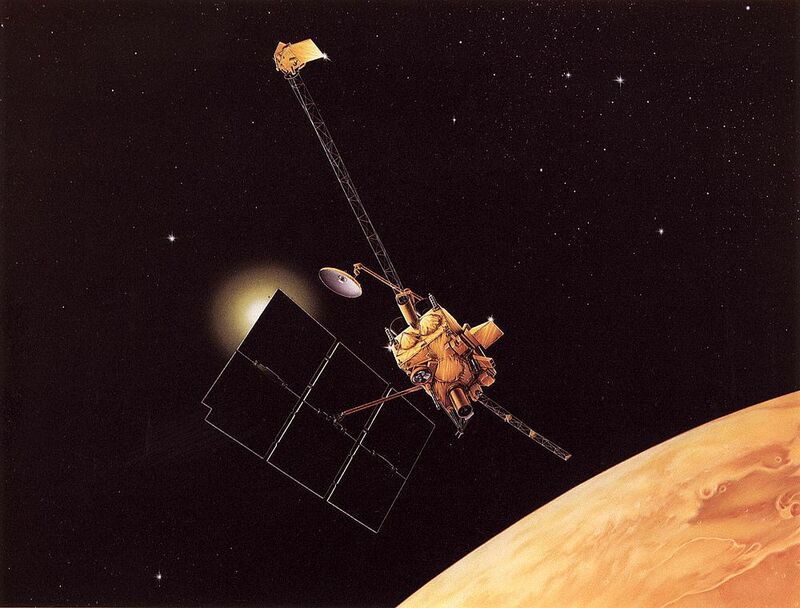 Contact with the probe was lost on 21 August 1993, just before it reached Mars. NASA launched STS 86 (Atlantis 20, 87th Shuttle mission) for the seventh Shuttle-Mir docking mission. An Ariane 44LP launched from Kourou carried Telstar 7 to orbit, which was positioned in geostationary orbit at 129 deg E, later sold to Intelsat and renamed IA-7. Telstar 7, owned by Loral Skynet, was launched 25 September 1999, and had 24 C-band and 24 Ku-band transponders. Its dry mass was 1537 kg. After placement in its final geosynchronous orbit, it provided communications for North America from a position at 129 degrees East longitude. The satellite was sold to Intelsat in March 2004 and renamed IA-7. It suffered a power failure on 28 November 2004 and was briefly declared lost. Intelsat recovered control of the satellite by 4 December 2004. An Ariane 44P launched from Kourou carried the Atlantic Bird 2 geostationary satellite to orbit, to provide high speed TV, video streaming, radio and Internet services between North and South America, Europe, North Africa, and the Middle East. The Vitim event or Bodaybo event, believed to be an impact by a bolide or comet nucleus in the Vitim River basin, occurred near the town of Bodaybo in the Mamsko-Chuisky district of Irkutsk Oblast, Siberia, Russia. The Vitim event or Bodaybo event is believed to be an impact by a bolide or comet nucleus in the Vitim River basin. It occurred near the town of Bodaybo in the Mamsko-Chuisky district of Irkutsk Oblast, Siberia, Russia on 25 September 2002 at approximately 10 p.m. (local time). The event was also detected by a US anti-missile defense military satellite. V.A. Chernobrov suggested that the Vitim event could be caused by a falling of a comet nucleus with a diameter about 50-100 meters. The links on the Wikipedia page contain more interesting information. Russia launched Progress M1-9 (NASA designation: Progress 9P) from Baikonur to the International Space Station to deliver food, fuel, and supplies. Progress-M1 9 (NASA designation Progress 9P), launched 25 September 2002, was a Russian automatic cargo transportation craft that delivered food, fuel, and supplies to the International Space Station (ISS), whose launch had been delayed from 22 July, 10 September, and 20 September. It docked with the Zvezda module of the ISS on 29 September at 1700 UTC. Prior to the docking, the port was vacated by the earlier Progress-M 46. Progress-M1 9 undocked from the station on 1 February 2003, and was commanded to destructive re-entry in the atmosphere.